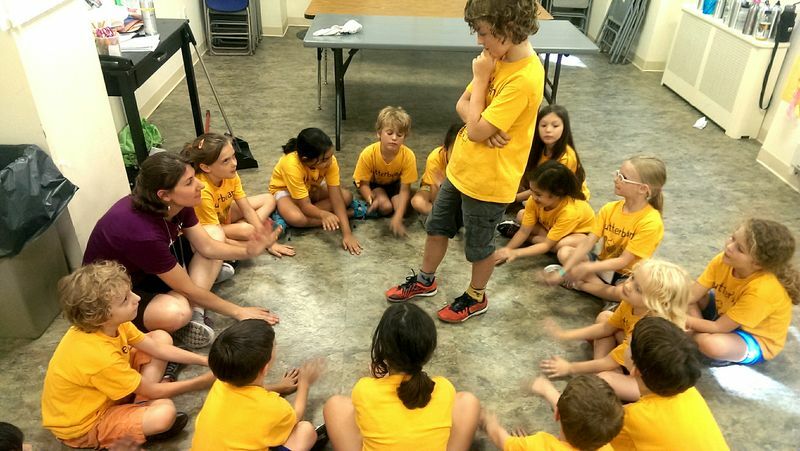 summer camp fun – week 5! We kicked off our third and final session of the summer with eleven new campers this week! Despite the threat of rain on several occasions, our team of Butter Beans purple + yellow managed to stay dry, eat well, and learn a ton of exciting new things! 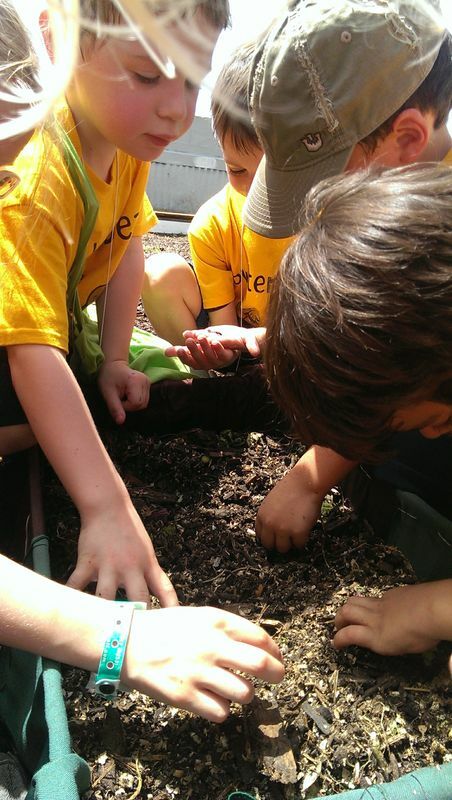 After a short introduction, our campers traveled to the South Brooklyn Children’s Garden for an afternoon of hands on activities. 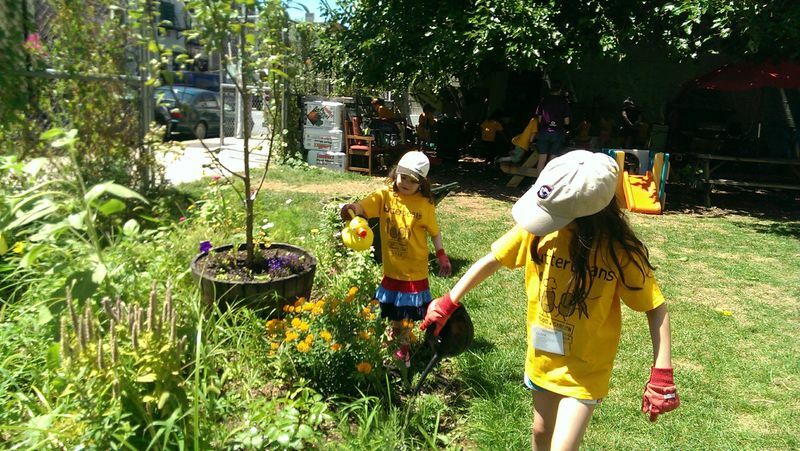 It was great to be at a garden designed for kids, and the campers felt right at home among the plants. We spent some time bonding in the playground before heading back to wrap up our first afternoon. 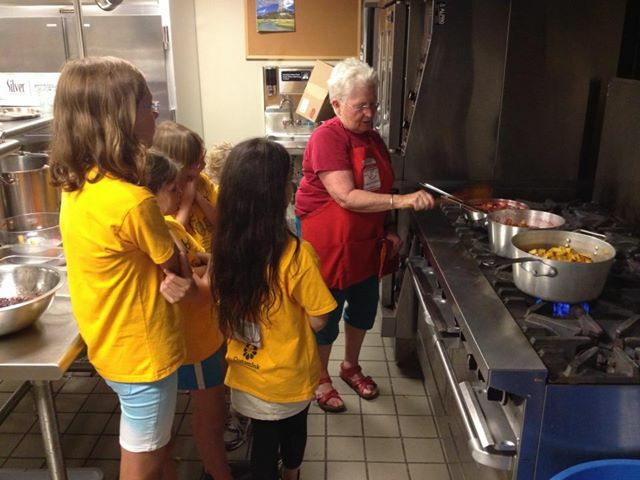 On Tuesday our campers had their first full day in the kitchen! 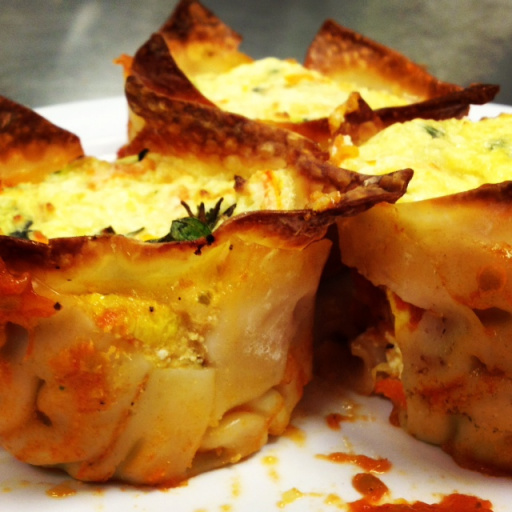 After planting our own seeds, everyone was hungry for a Lasagna Cupcake lunch! Served with homemade garlic bread and salad, it was like being in Little Italy! To celebrate the perfect August day, we spent the afternoon outdoors enjoying the sunshine. Wednesday brought gloomy skies, and rather than risk being stuck in the rain we decided to hang back at camp and do some more cooking! We traveled to the Union Square Farmers Market in the morning, and returned to camp to make a wholesome lunch of Tomato Soup and Panzanella Salad. We used our leftover garlic bread from the day before, which added great flavor and helped us clean out the fridge. After lunch, we ventured to Brooklyn for a visit at NuNu Chocolates. We learned about how chocolate was actually used as currency in the olden days, and we each got to dip our own graham crackers in the melted goodness. Yum! We love to make ice cream at camp, and on Thursday we visited Chloe’s Soft Serve Fruit Co. to learn about non-dairy ice cream from the pros. We made healthy sundaes with banana, strawberry, and mango ‘ice cream’, which was a great way to fuel up for our next adventure to East New York Farms. They are experts at bee keeping, and at the farm we got to taste honey straight from the hive, try on some bee suits, and learn about the art of keeping bees in the city. The honey was fresh and sweet, and everyone walked away with a little more appreciation for our black and white stripped friends. Friday brought another edition of Top Chef! This week, our campers worked together to make a Taco Fiesta, including homemade guacamole, salsa, and tortillas! These definitely weren’t your average tacos. Following lunch, Ingrid was back for another afternoon of yoga. It was a nice way to relax on such a dreary day, and a great way to welcome the weekend. We finished off the afternoon with a special dessert and movie. It’s hard to believe that next week will be the last week of the summer! After months of anticipation and planning, it seems like the end came much too quickly. I couldn’t ask for a better group of campers to help close out the summer, and I am looking forward to a final week packed with food, farming, and fun! 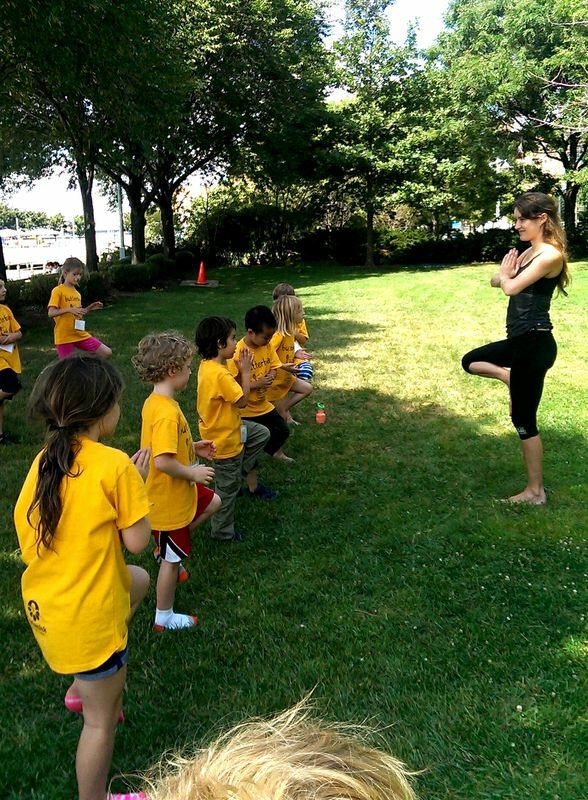 summer camp fun – week 4! It’s hard to believe that the second session of camp is already coming to an end! Although it seems like the summer just started, we are about to say goodbye to our second session of campers. We’ve had a full house these past two weeks, filled with nutritious and delicious meals, dirt under our fingernails fun, and special guest visitors! 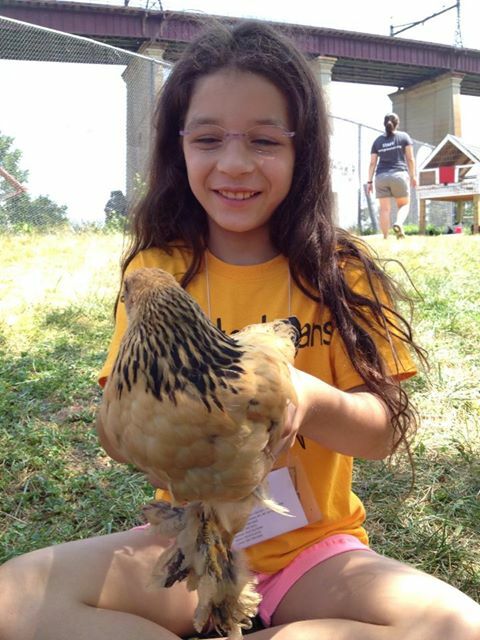 Monday, our fearless group travelled to Randall’s Island for a day at the Urban Farm and Children’s Garden. It was a beautiful day to be outside, explore the gardens, make some tzatziki with fresh vegetables, and hold the chickens! On Tuesday, the campers got back to basics in the morning with homemade cornbread muffins and fresh butter. 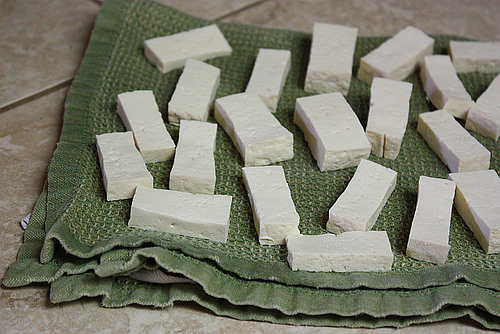 The homemade butter was especially delicious, and came in handy later in the week. In the afternoon, everyone traveled to Central Park to try their hand at fishing! Although no one caught anything, it was nice afternoon to be in park and explore nature. Wednesday was a jam packed [pun intended!] day at camp. We took a trip to the farmers market in the morning to buy ingredients for our jam lesson in the afternoon, as well as fresh produce for our gazpacho and grilled cheese lunch. The infamous Beth from Beth’s Farmhouse Kitchen came by in the afternoon to lead our campers in a jam making lesson. We made fresh blueberry and nectarine/plum/peach jam; I hope the campers shared their jars with everyone at home! Thursday we were back in the kitchen making a Middle Eastern themed lunch of baked falafels and tabbouleh. We also continued our exploration of composting with our very own worms! They are working their magic in our homemade compost buckets and we should have beautiful soil in no time. Looking at a figure full of leftovers, we also decided to repurpose some of our extra cornbread into Leftover Cornbread Bread Pudding. It’s always fun to try and use leftover or ingredients in new ways, and the sweet cornbread dessert was a hit! For our last day of camp, we hit the farmers market for another edition of Top Chef Friday. As you can imagine, homemade pizzas were a big hit and it was awesome to make the whole thing – dough, sauce, and toppings – from scratch! With full bellies, we capped off our second session with yoga and a special graduation ceremony for all our budding young chefs! I am sad to see another incredible group of campers go, but I am looking forward to what the next, and last, session of the summer has in store. If these next two weeks are anything like the last four, I can confidently say that I have had one of the best summers to date. Whether in the kitchen, at the farm, or just hanging out at camp it’s been a pleasure to share these last two weeks with all our amazing campers, and I don’t want to the summer to end! 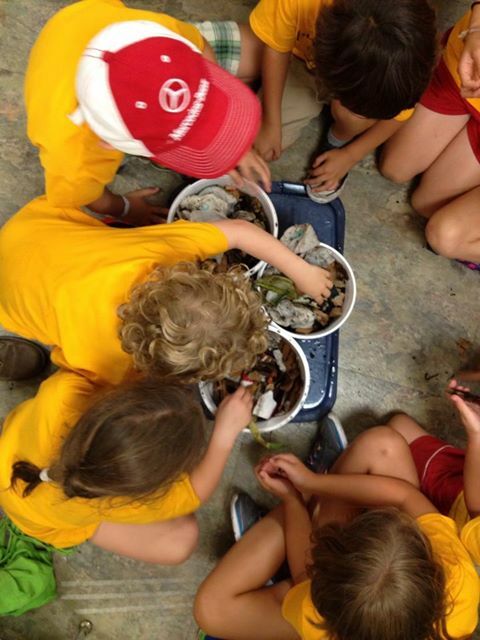 summer camp fun – week 2! The second week of our first camp session is drawing to a close, and I can’t believe all the amazing things our campers have done over these past two weeks! 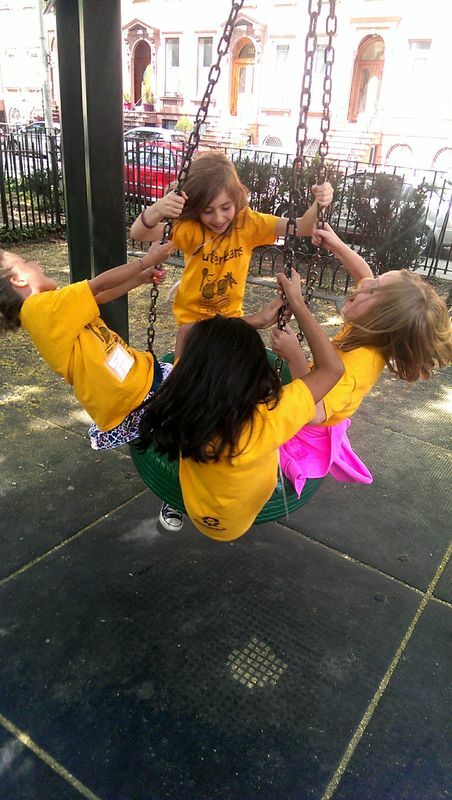 Despite the heat wave, our campers had a week of fun and adventures. Although we were disappointed not to be able to go on some of the trips we had planned, our days were full of delicious new recipes, art + garden activities, and a special heat wave treat! On Monday, our campers braved the great outdoors for an interactive and fun trip to the Brooklyn Grange. 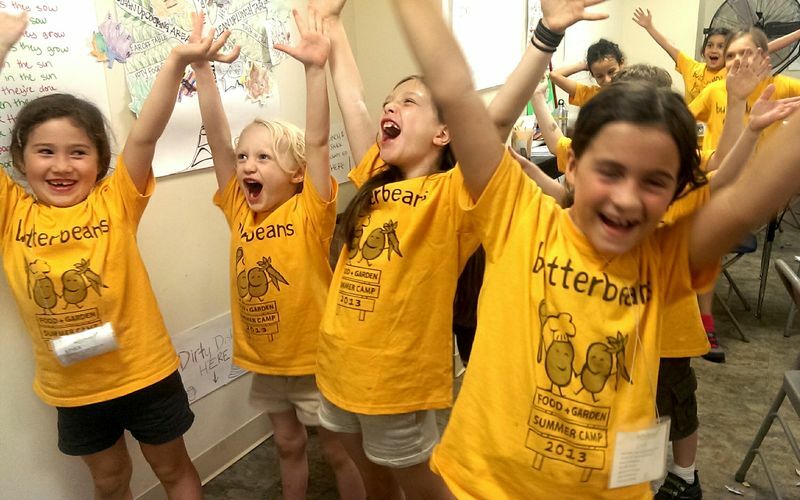 There, our campers learned about bee pollination, harvesting vegetables, and a great song about compost which we put to good use later in the week. They also had the opportunity to create a delicious quinoa salad using fresh vegetables from the farm. On Tuesday, we spent some time in the kitchen baking nutritious morning glory muffins. Everyone thought it was fun to see how good vegetables can taste in a muffin, and they were the perfect mid-morning snack before an afternoon at the movies! To escape the heat, everyone made a special trip to the theater for a showing of Despicable Me 2. It was a nice way to eas into the hot week ahead. Wednesday was a very exciting day at camp. 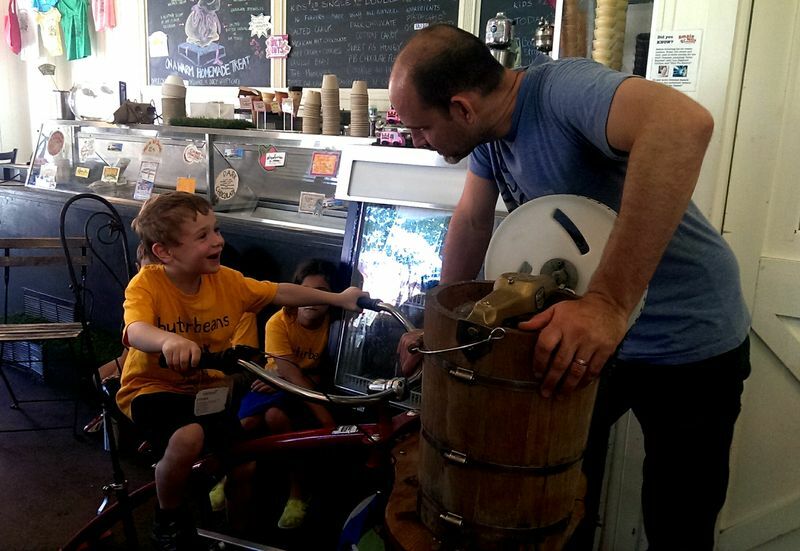 After a few long days of anticipation, our campers traveled to Ample Hill Ice Cream where they learned about the ice cream making process, and then made their own vanilla ice cream on a bicycle! 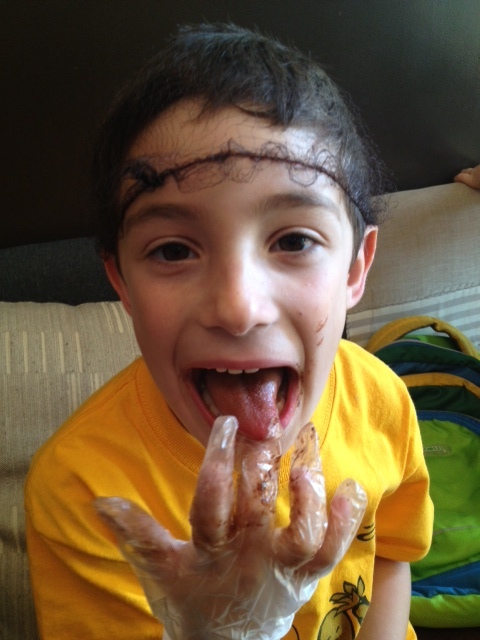 It was a big hit among the campers, and everyone was very excited to finally taste what they had churned. The campers returned ready for some nourishing food, and worked together to make tomato, mozzarella + pesto sandwiches. We rounded out the afternoon by making our own play dough and dying it using different foods! We had blueberries for purple/blue, pureed kale for green, and ketchup for red/orange. Thursday we started the day with sparkling fruit sangria [don’t worry… it was kid friendly!]. White grape juice, seltzer, peaches, grapes, and nectarines made a refreshing drink before our morning art project. For lunch, we worked hard to make veggie hand pies + mashed potatoes. The campers even made the dough from scratch, and they were delicious. During lunch I even overheard one camper exclaim ‘This is the best thing I have ever tasted!’ Needless to say we have some budding young chefs among us. As a Friday treat, we made another round of popsicles [blueberry + ‘coconut cream’] in the morning before heading the Union Square Farmers Market for another edition of Top Chef – Grain Salad! Each group bought three different color vegetables, 1 herb, and 1 type of salad green to mix with their quinoa, couscous, or brown rice. It was the perfect lunch for such a steamy day. We finished off the week with a relaxing yoga class. As our first session drew to a close we presented our Food + Garden experts with their very own cookbooks, a graduation certificate, and a golden spatula to symbolize their time with Butter Beans. If you follow our blog, you most likely love to cook. Well, we are in good company! We are part of a movement that is inspiring our audiences to cook at home, fostering relationships with family, friends, neighbors, while furthering physical, mental and spiritual health. Cooking doesn’t have to be fancy or feel out of reach. On the contrary, cooking should be seen as simple, approachable and fun! With all of the jarring statistics we hear everyday, it’s comforting to know that we can change ourselves, our families, our communities by using our own two hands. Grocery shopping, turning on that oven, prepping those ingredients, and sitting down at the table can have profound effects on everyone involved in the process. Join Dr. Mark Hyman for an “eat-in” on April 7th, to “take back our health by avoiding restaurants and packaged foods.” On this day he asks us to make real, whole, fresh food and invite family and friends over to share in that moment. Let’s all pledge to prepare more food at home, and help educate and inspire others to do the same. Happy healthy eating to all! In a warm, sun-filled lunchroom nearly 100 soft hands popped right up. That is the point at which my heart melted faster than the cheese on the lasagna we served the day before. It seemed that in a room of 100 students, almost every single hand was up, way up. This—is why I am a lunch lady. Butter Beans just opened up in a school that moved into a brand new location in Brooklyn. At the very start of the New Year, teachers and “scholars” (as the students are called), beamed as they entered the building for the first time with a brilliance that rivaled the glimmer of the beautiful new facility. Serving food here has been truly monumental for both the students and the staff, and I beam with pride and joy every time a teacher recounts another success story about the impression the lunch service is having on the students and the teaching staff alike, and they just keep coming. One teacher told me that a student said, ‘Ms. A—you have to try the Butter Beans food, it’s so good that even the teachers eat it!” Another time, I overheard a student remark, ‘This milk is so good it tastes like it came straight from the cow!’ Every week since we started serving lunch here, I’ve been amazed to have to increase the amount of vegetables that we order from the kitchen to prep and serve at the cold bar. Teachers tell me they themselves feel markedly different in their day after being nourished by the well-balanced and love-filled meals prepared by the talented Butter Beans chefs. The principal laughed as he confided in me that one parent said that their child regularly comes home and only wants to talk about how good lunch was that day! While there are some students who are still adjusting to our foods, like our homemade parfaits (the principal assured me that the students are used to yogurts with higher sugar content) – with a little bit of encouraging, plenty of support from the staff, and with the continuing effort of the Butter Beans team to create meals that are both healthy and tasty, one by one the scholars will come around, and they will undoubtedly feel the difference the taste makes. This post was contributed by Madison Sheffield, Butter Beans Cooking Instructor, Curriculum Developer & Food Service Supervisor.